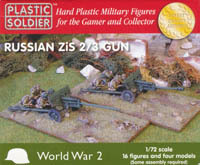 As you can see above, this product comes with four gun kits, each of which can be made up as either the 57mm M1943 anti-tank gun (ZiS-2) or the 76.2mm M1942 field gun (ZiS-3). Both guns were excellent examples of the species and produced in large quantities. From the dates specified both shared the same carriage, with the tubular steel trail legs, which means for the purpose of these models the only difference is in the barrels and, of course, the size of the ammunition. The long (70-calibre) barrel of the ZiS-2 is pictured first, and despite being a single piece is very nicely detailed and looks really good. Some purists might like to have a large number of parts to make a complex model, but this one looks the part is of course requires no assembly; handy if you are making up large numbers. Equally good is the 76.2mm ZiS 3, which is pictured below the ZiS-2 barrel, and is also shown as the full model. This was primarily a field gun, but was often and very successfully used in an anti-tank role. Again although one piece, this is nicely detailed and looks great. The common carriage is made up simply of axle, shield and trail legs, and comes with a choice of steel, tyred wheels. The trail legs can be closed for towing, or at any angle for firing, and once again make up a very nice model that is quick to put together. A selection of ammunition for both weapons, some boxed, completes this part of the kit. The crew figures are exactly the same as those found in the Plastic Soldier set of 45mm Anti-Tank Gun, so our comments in that review apply equally here. In summary that means all the figures are fine, with suitable uniforms and kit, and well posed. All have some element of assembly, and we were a little disappointed that there were not enough helmeted heads for all of them. The sculpting is good, but it should be observed that an all-crouching crew, while not impossible, is less appropriate for the larger weapons in this set. Everything goes together easily, and with the choice of barrel and four guns per box this is a good value set. In short, another very good addition to the firepower of the Red Army in the later years of the War, quick to put together and delivering an unsophisticated but workmanlike result, a bit like the original guns themselves.